Make these quick and easy Refrigerator Bread and Butter Pickles with no canning equipment or fuss. 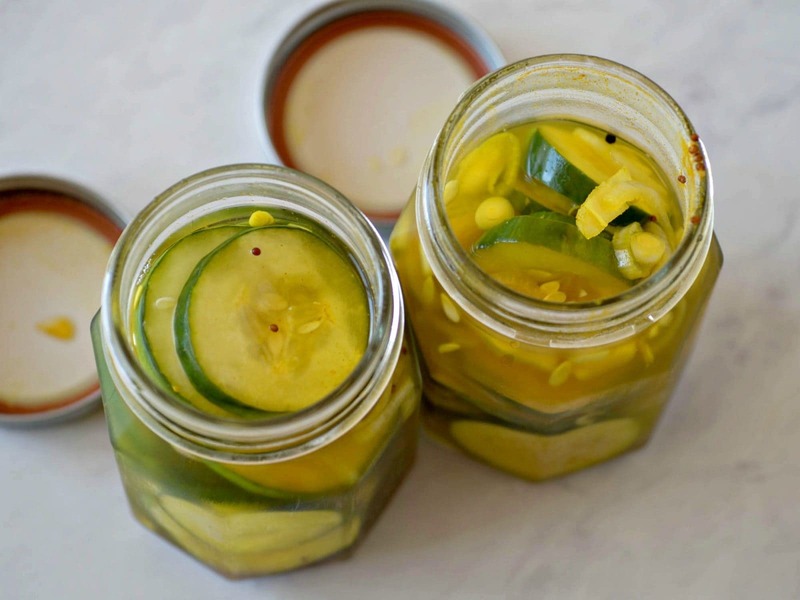 These homemade pickles are made from garden fresh cucumbers, vinegar and spices for an easy side dish for your summer cookouts. 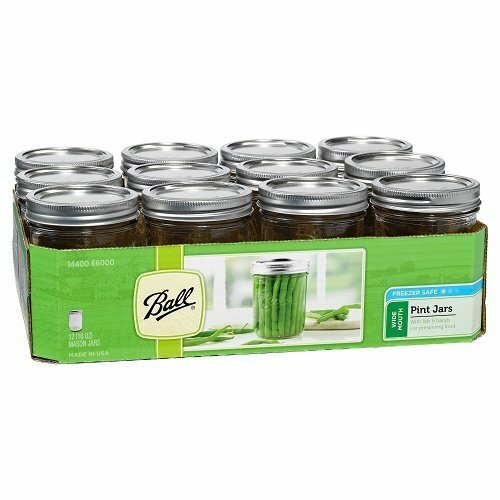 I like to make homemade pickles, but I don’t really like canning. I’ve done it before, but it is time consuming, messy and I always worry about the possibility of messing something up and getting people sick. So when I make pickles it is quick refrigerator pickles. 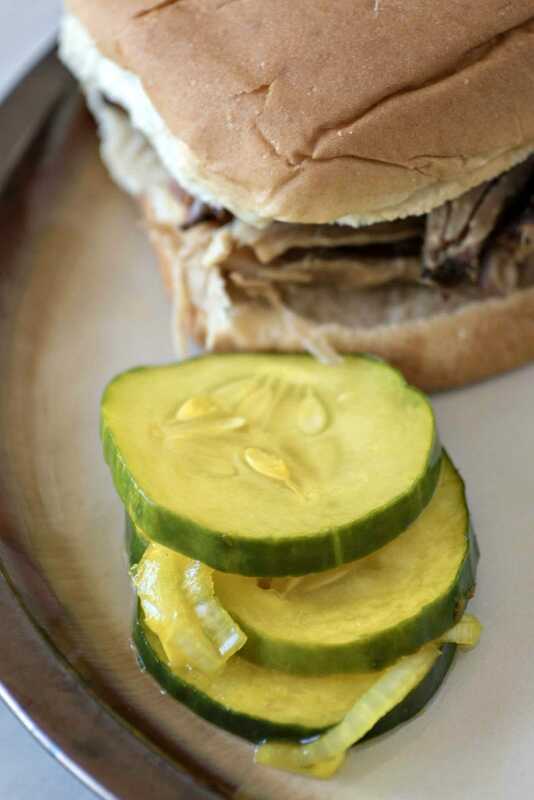 These refrigerator bread and butter pickles are easy to make and will be ready to eat in 24 hours, so you can enjoy them the next day. 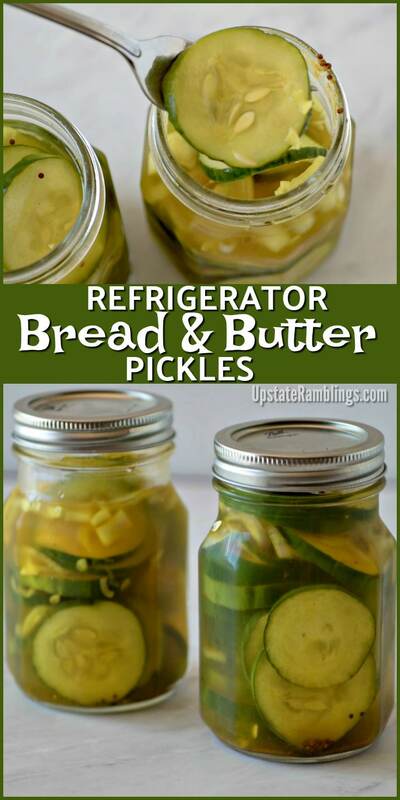 Many recipes for Refrigerator Bread and Butter Pickles use lots of cucumbers and make a whole bunch of jars. 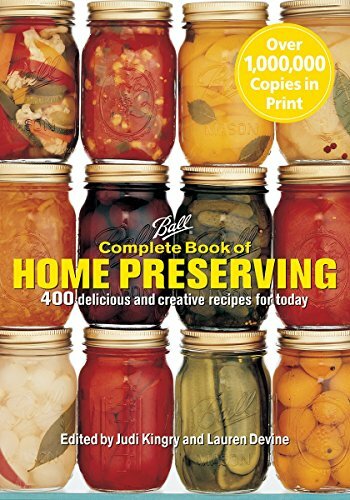 Which is fine if you are canning the pickles and preserving them for the winter, but I don’t have room in my refrigerator for 5 jars of pickles. I made this recipe in 2 pint mason jars or it would fit into 1 quart jar. This leaves me plenty of room in the refrigerator for other things, and is also a quantity my family can eat in a month. For refrigerator pickles a small batch is plenty. I like to slice my cucumbers about 1/8″ thick for pickles. You can make them thicker at 1/4″ thick, but the thicker they are the harder it is to fit them into a jar. I usually use regular cucumbers so my pickles are larger but some people prefer to use the smaller pickling cucumbers and have little pickles. After slicing the cucumbers the next step in making these pickles is to salt the cucumbers and let them sit for a few hours. 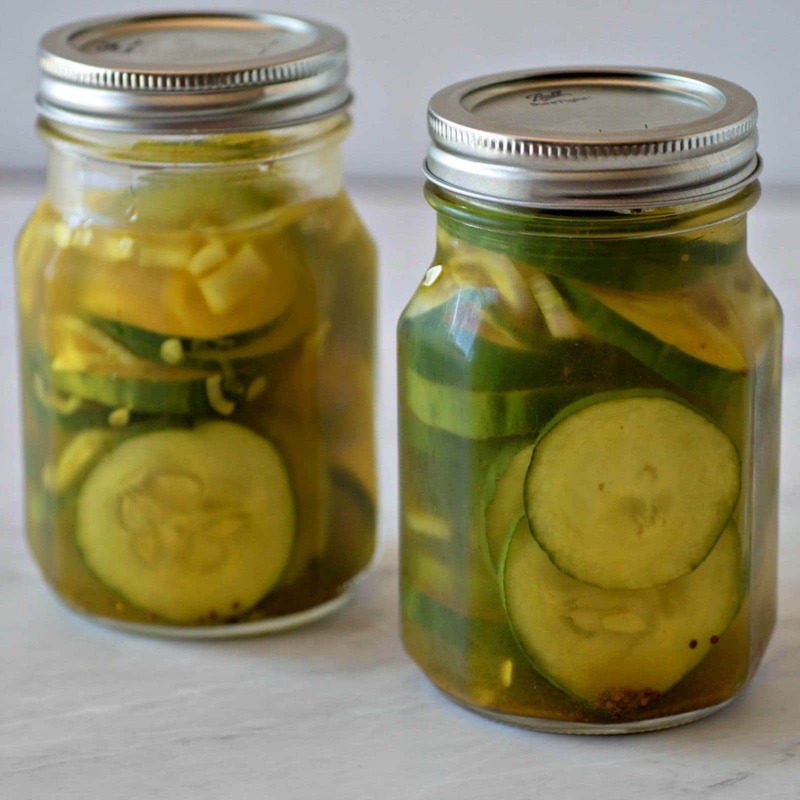 Cucumbers have a high water content and the salting helps draw the water out which makes the resulting pickles crisp, not soggy. Then the pickling brine is made by mixing vinegar with some sugar and spices and boiling it. Boiling the brine not only makes the sugar dissolve, it also releases the flavor in the spices and speeds up the pickling process. 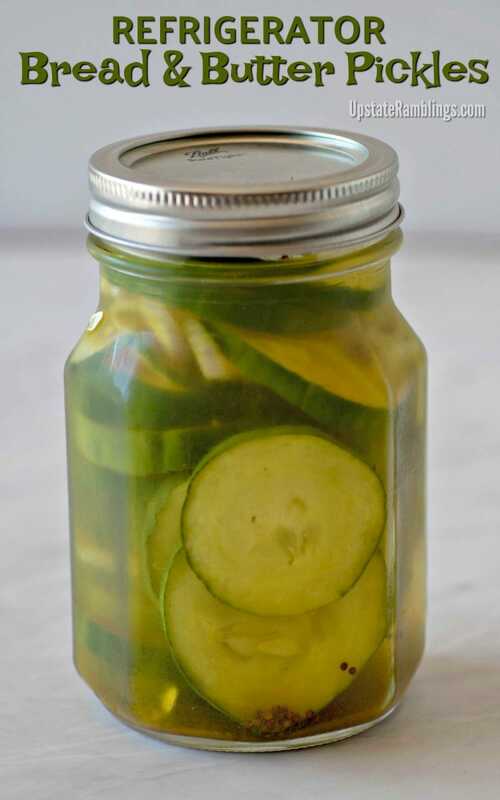 If you used cold brine the pickles wouldn’t be ready for days. After the brine is boiled the mason jars are packed full of vegetables and the brine is poured over the top. Then the jars are capped off and cooled before storing them in the refrigerator. The cucumber pickles will be ready to eat in a day and if properly refrigerated should last for 3-4 weeks. What Are Bread and Butter Pickles? 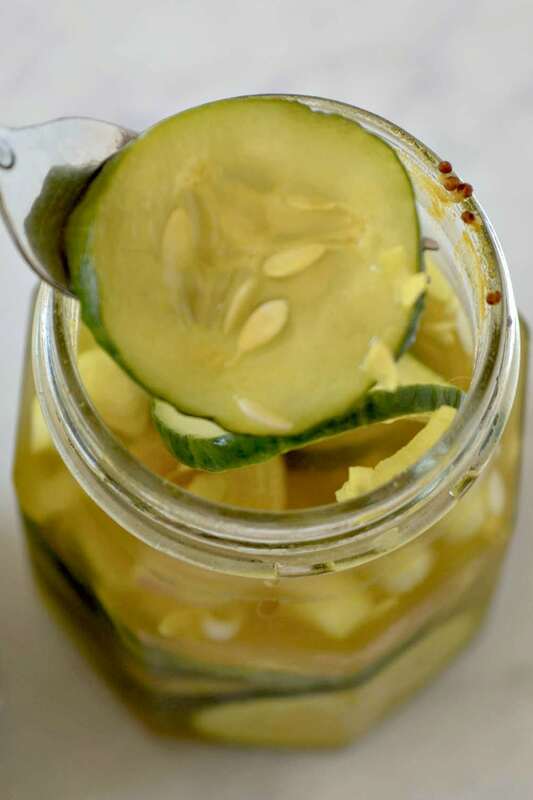 Bread and Butter pickles are a variation of a sweet pickle. Traditionally the cucumbers are combined with onion (I used a shallot) and pickled with vinegar and mustard seed. Although the pickles are sweet they are also tangy. They are served on sandwiches or burgers or just eaten plain. I don’t like pickles which are overly sweet, so my recipe has less sugar than many other ones you will find, but they are still sweet. Why are They Called Bread and Butter Pickles? Supposedly the name goes back to the Depression era, when food was scarce. The pickles were served as a sandwich filling paired with bread and butter for a cheap meal. Cucumbers are easy to grow and prolific, so they were popular to serve in a sandwich, either fresh or pickled. I have personally never tried a pickle sandwich, but it would be interesting to see how filling it really was. 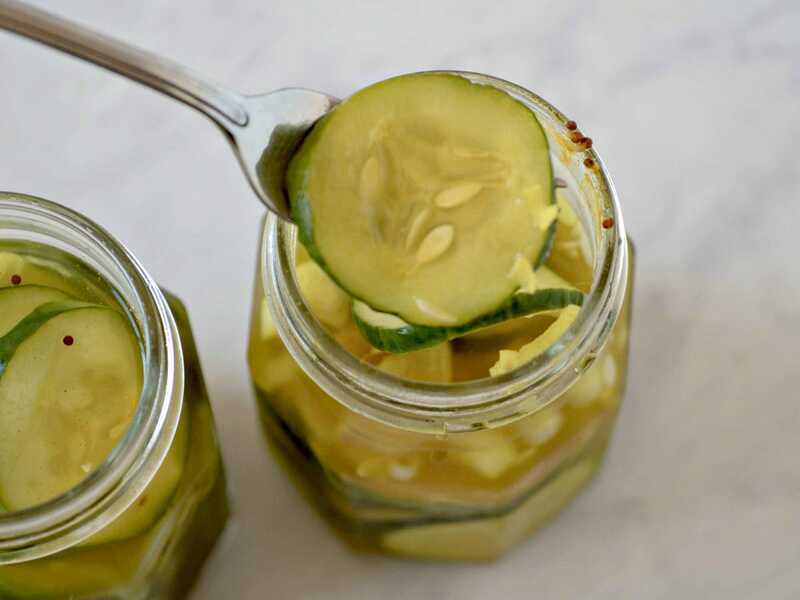 Make these quick and easy Refrigerator Bread and Butter Pickles with no canning equipment or fuss. 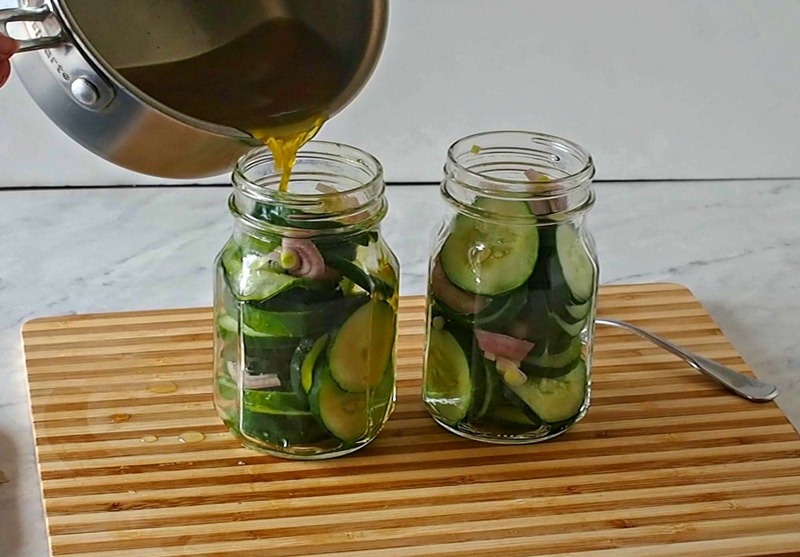 These homemade pickles are the best for summer sandwiches. Slice the cucumbers into 1/8" slices. Finely dice the shallot. 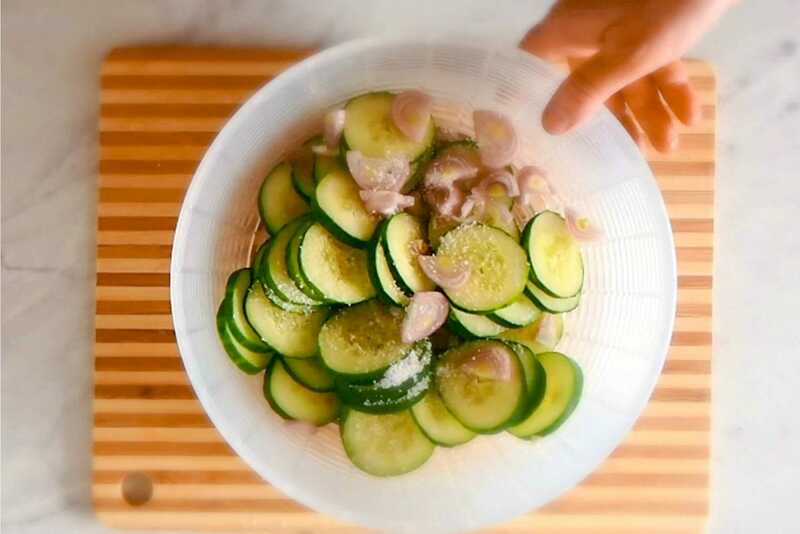 Put the cucumbers and shallots in a colander and sprinkle with the salt. Let sit for 2-3 hours. Rinse the cucumbers and shallots off and let them drain. Combine the cider vinegar, water, sugar, mustard seed and turmeric in a saucepan and bring to a boil. Stir to dissolve the sugar. Place the cucumbers and shallots into two pint jars. Try to pack them tightly without squishing them. Pour the hot vinegar mixture over the vegetables to within 1/2" of the top of the jar. Tap the jars lightly on the counter or gently run a rubber spatula around the outside to dislodge air bubbles. Screw a lid on let the jars stand at room temperature for about an hour, then refrigerate. The pickles are ready to eat in 1 day and keep for about a month in the refrigerator. 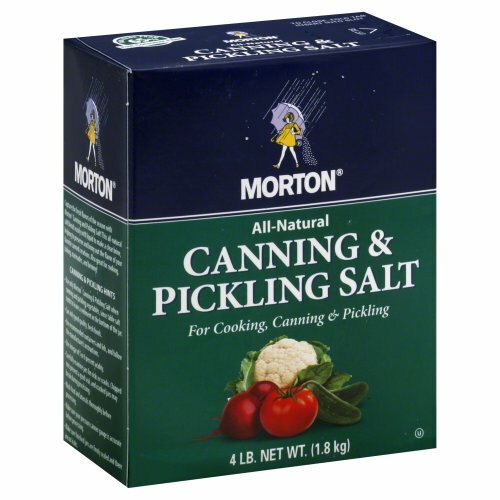 If you don’t have pickling salt or kosher salt you can use table salt. 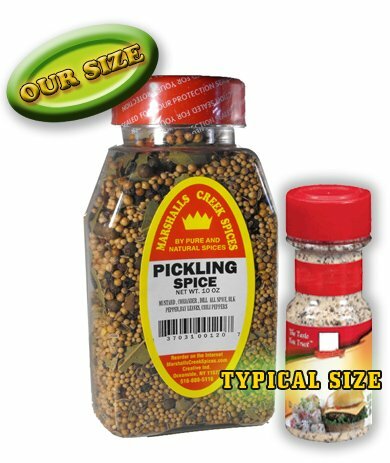 The table salt has additives which can cause the pickles to become discolored or make the pickling solution cloudy. So they won’t look as pretty, but they are fine to eat. You could substitute 1/4 cup of onion for the shallot. If the brine doesn’t quite cover the cucumbers add a little bit of warm water to fully cover the vegetables. Because these pickles are not canned the vinegar to water ratio is not crucial and a little extra water will not hurt the pickles. Finally a recipe for a smaller amount! Thank you!